Which Wireless Access Point Do I Need, 2x2 or 3x3 MIMO? Here in the Charlotte, NC area we have been fighting to get some of our roads widened to relieve the congestion we fight each day to and from our places of business. As a means of resolution to this challenge the state has decided to move forward with instituting toll roads. I am less than hopeful that this solution will alleviate the congestion because it isn’t quite what I or my other fellow commuters had envisioned as optimal. The toll road they want to institute will charge a fee which fluctuates based on the time of day and current demand on the road. Peak travel times = more $$$. From estimates based on Atlanta’s toll roads we are expecting $5 - $8 per commute into the city each day. This is an expense that most of us aren’t happy to pay and likely will keep most of us in the current two, non-toll, lanes we currently occupy. Designing an enterprise-grade wireless network is not easy--especially if you don't know where to start. 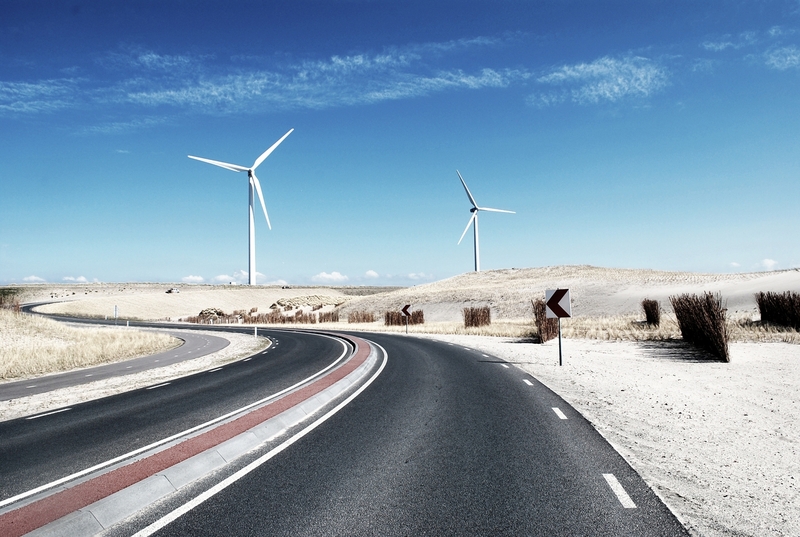 Join 1000's of other businesses and Download our Wireless Network Design Kit today. As I started to think more about this issue it became apparent to me it is similar to the discussions I have had with customers about the differences between 2x2 and 3x3 MIMO access points. Similar to a road, you can think of an AP in terms of its’ transmit (TX) and receive (RX) MIMO streams. Each TX or RX stream is a lane on a road and the more lanes you have the faster traffic is going to move because of decreased congestion. Now, if you can only utilize two of those lanes the third one (the toll lane) is really no use to you and is only going to be occupied by a select few, i.e. those who can afford it. Devices that have a single antenna and radio are 1x1 MIMO devices and will only be able to communicate via a single stream of transmit or receive with an access point. 2x2 MIMO devices with dual antennas and radios will be able to communicate via two streams of transmit and receive. A 3x3 MIMO device with 3 antennas and radios is capable of transmitting and receiving via three streams. All these streams afford the device more bandwidth capacity when downloading and uploading data to and from the wireless network. The more bandwidth or the faster the devices’ speed on the network the better the performance for everyone overall who is connected to the same access point. An analogy I like to use often is that of 1 straw versus 3 straws in your drink. 3 straws in a drink will allow you to consume your beverage 3x faster than someone with only 1 straw in their drink. The same goes for wireless. Someone with a 3 stream MIMO device will get their data quicker and will allow others waiting in line to get their data much sooner than the 1 stream MIMO device. In terms of purchasing APs and deciding between a 2x2 or 3x3 MIMO model you need to look at the devices on your network and if the majority can take advantage of the extra TX/RX stream. Most mobile phones only have a single antenna which precludes them from doing anything other than 1x1 MIMO. The same goes for most tablets including iPads, Android and Windows devices. The single antenna and 1x1 TX/RX capability saves on battery but still provides enough throughput to support the services and apps on the device. 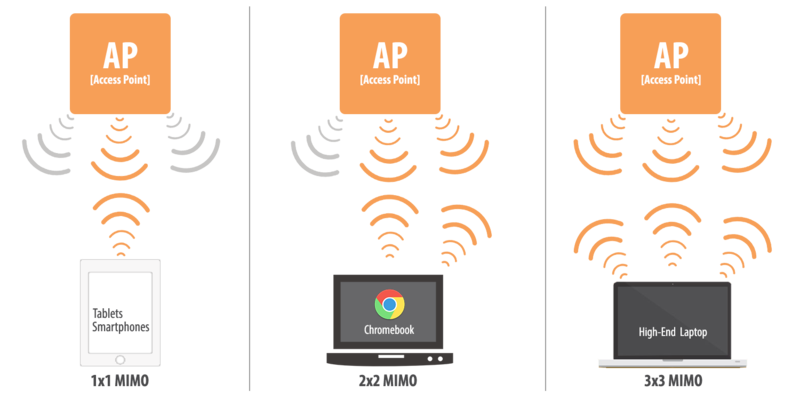 2x2 TX/RX MIMO devices are typically Chromebooks and standard notebooks and laptops. 3x3 TX/RX MIMO devices are only high end laptops like the MacBook Air and business class units from Dell, Lenovo and HP. From what we see in most customers’ environments this is roughly the device profile breakdown. 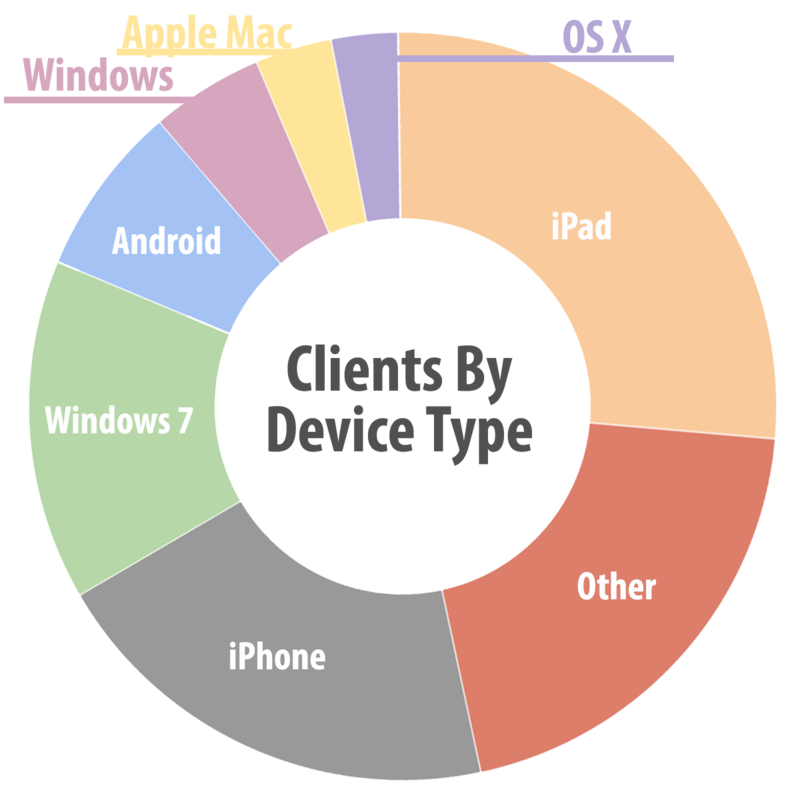 Here is a graphic taken from a sampling of 6,000 devices in 50 different client networks showing roughly about the same breakdown of devices. 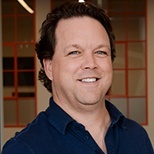 When the discussion turns to when to purchase 3x3 over 2x2 MIMO access points we need to understand the device types on the customer network and their bandwidth needs. If the majority of the device types are going to be 1x1 or 2x2 devices it doesn’t make sense to spend the extra money to provide an optimal experience for a very small percentage of devices. If the majority however, are going to be 3x3 capable devices, than I would recommend going for the 3x3 capable access points. It is also an option to use the 3x3 access points in areas where that little bit of extra performance is going to help a greater number of users. These areas would be auditoriums, libraries, conference rooms, board rooms, media centers and any other areas where you might have a very large gathering of users and their devices. The extra bit of performance the 3x3 access points provide will go a long way in these areas. In my toll road analogy, the way I see it, is that the majority of tax payers (lower end devices) will be using the same two lanes (2x2 MIMO) we have always used and we won’t see any benefits. However, the minority of tax payers (higher end devices) who can afford it, will be using the toll lane (3x3 MIMO) and seeing the benefit of much quicker commutes. In other words the money spent on this project will be going to support a very small minority of commuters (20% of 3x3 MIMO devices) which in my estimate doesn’t make much sense.